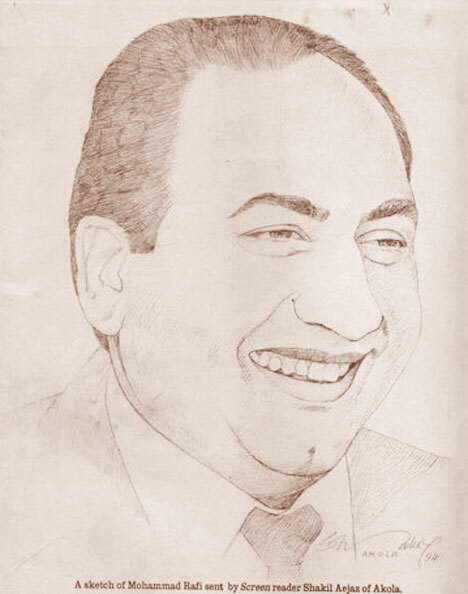 On 31st July 1980, legendary singer Mohammad Rafi left us, leaving behind thousands of immortal songs for us to cherish. Mohammad Rafi, or Rafi sahib as he is always addressed with respect, was not only a great singer, but also a great human being. His versatility was unmatched. He was a master in all types of songs -right from patriotic songs to songs with the sweetness of romance, from songs of utter despair or melancholy to light hearted comedy songs, bhajans, ghazals, quawwalis etcâ€¦.the list is endless. Who can believe that the man who had sung â€œYe mehlon ye takhton ye tajon ki duniyaâ€ for the intense Guru Dutt had also sung â€œMain Jat yamla pagla diwanaâ€ for the macho Dharmendra or the man who sang â€œO duniya ke rakhwale â€ for a staid Bharat Bhushan also sang â€œ Chahe mujhe koi jungle kaheâ€ for the energetic Shammi Kapoor. Teaching a child â€œ Tu hindu banega na musalman banega, insaan ki aulad hai insaan banegaâ€ was as easy for him as romancing a lady with â€œTeri ankhon ke Siva duniya mein rakha kya hiaâ€ . With intensity he hits out at the society with â€œJinhe naaz hai Hind par who kahan haiâ€ for the protagonist Guru Dutt in Pyasa and sings a light-hearted â€œ Sar jo tera chakraye ya dil duba jaye â€ for the comedian Johnny Walker in the same film. In spite of being a teetotaler he could sing as a â€˜sharabiâ€™ with perfection (mujhe duniya walon sharabi na samjho ), and in spite of being very shy (he rarely spoke or gave interviews) sung so many songs with a mischief (one should just listen to the variations in â€˜gustakhi maafâ€™ in the song chehere pe giri zulfen kah do to utha doon mein) . Be it bhajans (Man tarpat Hari darshan ko aaj, Sukh ke sab sathi dukh mein na koi), ghazals (mere mehboob tujhe meri mohabbat ki kasam, Na kisi ki ankh ka noor hoon) , and quawwalis ( Na to caravan ki talash hai, hai agar dushman zaman gam nahin) , his fervor in singing these distinct styles was unmatched. In the cut-throat film world he shone like a beacon, helping the needy and not running after money, fame etc. For millions of Indians, the day is not complete without listening to his songs. During happy moments or sad moments, his voice is always there to give comfort. Even if we have forgotten him (one Padma Shri award was the best we could give him!!) he wished us all good with â€œMeri kahani bhoolne wale tera jahan aabad raheâ€(even if you forget my story let your life be full of prosperity). This entry was posted on Wednesday, July 30th, 2008 at 8:53 pm	and is filed under Meri Awaaz Suno. You can follow any responses to this entry through the RSS 2.0 feed. You can leave a response, or trackback from your own site. i have to say my salaam to all rafiji’s fan. 1.-Excellent article..we await many more from you..
all the channels barring times now showed news & homages to the god of all gods – in playback singing shri mohammad rafi saaheb. in mumbai the english press by and large saw more opportunities in showing and talking about mallika sharawats, rakhi sawant and their semi-clad ilk in pictures and photos than a simple legend like mohd rafi,well , this is their mentality to take forward the page 3 crowed and advertise them as “national assets”. and, the times group came up with half paged “paid” advertisements by kothari of golden great group who released the homage ads on rafi saaheb. it had 30 different pictures of rafi saaheb with the songs on it which they played in the evening. well, they got some business on the day from a rafi lover. the marwari tycoons in the print media is out only to make profits and flaunt advertisements of minimum dreesed women as one see in their page 3 publications. for them music, melody, mohd rafi and divinity are matters expendable or forgotten. but , the common people , a thousand strong who gathered at rafis graveyard and the crores who remembered rafi saaheb on july 31 – will do exactly the same – each year around. my heart go out to those hundereds of rafi lovers in the times of india press and other journals who want to “write” on mohd rafi saaheb but are prevented by their masters/policy makers. meantime, there were about 20 shows in mumbai during the week and the electronic media fully covered the events in mumbai. My special thanks to ndtv, national and delhi, aaj tak -delhi for showing the developing news of july 31 along with a special 30 minute slot story on mohd rafi. also to the print media including pti, ians and the many who did special stories on mohd rafi in the last week of july. we should be grateful to radio worldspace for day long broadcast of about two hundred of rafi sahib’s best songs on july 31.the broadcast started at 8 am and ended at 12 night.I heard all the songs.it was a great feast of music and a great tribute to the greatest singer ever.if god himself were to sing he would sing like rafi. Rafi sahab we all love you and we will never forget you as long as we live. Muhammad Rafi was an unmatched Artist. He was a very nice and humble human being. His voice was like a water (liquid), as we see the road with alot of ditch, when there is a water the road will be leveled by the water. We are unable to watch these ditches. Similarly, Muhammad Rafi’s singing and his voice hide all the ditches in musical tone composed by the composer. Even now, there are 28 year to passed him away, Rafi Sahib ke maang mein Roz Baroz Izafa Hota Ja raha hai, because in this age people are understanding music much better then before. The list of Muhammad Rafi Sahib Fans’ is increasing day by day. Do you know, what is the reason behind this? The Reasons is that Muhammad Rafi did not give place to money instead of Heart Satisfaction. He sang when he was satisfied with the melody or tone of the song. Muhammad Rafi Sahab had sung what a perfect songs, which is the fact of the future. “Dil ka soona Saaz Tarana Dhonde ga, Teer Nigah-e-Naaz Nishana Dhonde Ga, MUJH KO MERE BAAD ZAMANA DHONDE GA. I do not have words to express my feelings for this greatest Artist. Short but pithy article about Rafi sahib’s Immortality and versatility. Rafi Sahib will be remained in every heart of music listeners. mujh ko mere baad zamaana dhoonde ga………. i want to thanks Mr Farrukh at http://www.radio4fm.com/ who is doing great show on our Mohd Rafi from 26/07/2008 to 30/7\2008 at 11 uae time and 12 30 India time and 0n 31/07\2008 from10 pm UAE time.